Are you an Indie music lover? Tired of typical pop/commercial clubs? Then Propaganda is the right place to be. 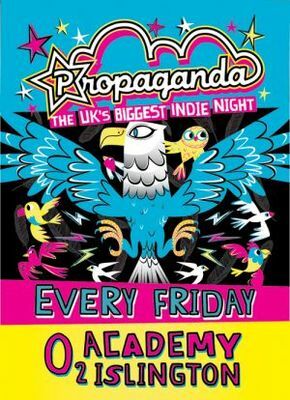 Every Friday of the week at O2 Academy Islington there's Propaganda, the best indie night in UK and Ireland. Over 20.000 people enjoy this night across the UK -Birmingham,Bristol,Cardiff, Celtenham,Dublin, Galsgow, Hertforshire, Leeds, Leicester, Liverpool and lovely London. The fun begins at 10:30pm and ends at 3.30am. The entry price is £5 in advance, £6 at the door. If you are searching for a place where to celebrate your birthday, then this is the suitable place. They have birthday guest lists available. There are two rooms with different music. 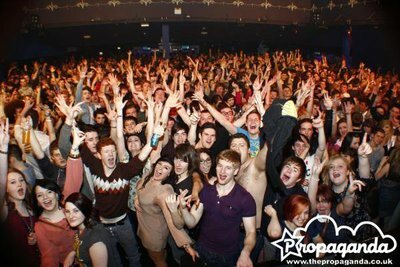 One is the Main Room which plays modern and classic indie alternative music, and the second one is the Digital Disco room where electro,house,dance and dubstep is played. For the full listings, check the events page.